It has been a crazy last couple of months for me. What with my thesis wrapping up, moving house and my foot operation. Couple that with Untappd increasing the maximum level for badges to 100 AND allowing them to be retroactive; you end up with an enormous number of badges to catch up on. Giving the huge number of badges, I've decided to reprise the format I use for Good Beer Week rather than write a post longer than most novels. It's still going to be an enormous post, but this is a more manageable approach. Some quick stats on this monstrous post for you before I get going. The post is 5,191 words long - I'm sure it's my longest ever! There are 80 different badges pictured and described, with 219 different levels across them! I've spent the best part of 6 weeks trying to get this post completed and have slowly come to the conclusion that it's an impossibility; every time I sit down to write I just unlock more and more badges. When the number clocked over 200 - I gave up and reverted to the format you see below. This post will double as a good reference post if anyone out there is looking to understand how to unlock most of the different badges. Home Brewed Goodness is the badge unlocked by drinking beers classified as Home Brews. Unlike most badges, this one is unlocked in levels of two rather than 5 beers. Middle of the Road is one of those badges that annoyed me endlessly when it was released. Literally every 6th or 7th beer I had would unlock this badge! Thankfully with Untappd finally allowing retroactive check-ins to count towards badges there were only four more of these! It's unlocked by drinking beers between 5.1%-9.9%ABV. Trip to the Farm is the badge for drinking different Saisons. Saisons are sometimes referred to as Farmhouse Ales, in honour of the the farms that these beers were traditionally brewed on in Belgium. Drink Like a Kiwi is unlocked by drinking beers from Australia's nearest neighbour; New Zealand. It would be hard to pick four better breweries from NZ, than those that were unlocked by the badges listed below. Verified Adventure is unlocked by checking into beers at venues that Untappd has "verified". Basically this means that Untappd has approved that the venue pours craft beer. These beers were unlocked at Hopscotch, Slowbeer Fitzroy & The Crafty Squire. Bar Explorer is a badge that commemorates the different locations that you've checked a beer in at. I'm not sure if this wasn't a bug in the system, but a VB at our new apartment unlocked the final level of this badge for me. Retroactive badges was always an inevitability for Untappd, such was the community sentiment. One of the badges I was most happy to see retroactivated was Wheel of Styles; the badge for drinking different styles of beer. A badge I hadn't seen since my first few months on Untappd was Photogenic. It's very easy to unlock this badge, simply add a photo with your check-in. Another badge that I'd long forgotten about was I Believe in IPA. This badge is also quite straight forward for the avid craft beer drinker; simply check into any five IPA's (and their variants - Black IPA, Imperial IPA etc.) and this badge is all yours. Black as the Night is the badge for drinking Black IPA's. I was surprised by it's relatively low level, as Black IPA's are a style, albeit slightly out of fashion, that I'm very partial towards. A badge that I don't really like due to the amount of overlap it has with other badges is The Dark Side. Dark Lagers, Black IPA's, Dark Ales and Belgian Strong Dark Ales are all styles that will allow you to unlock this badge. Down Under is the badge for drinking Australian beers. Naturally my first check-in of an Australian beer after retroactivity unlocked Level 100 of this badge. Collaborative beers are all the rage in the beer world at the moment. Naturally there is a badge to commemorate those beers; Better Together. The Sierra Nevada Beer Camp beers dominated this badge early on in the time period. My first South Korean craft beer also got a look in. Hopped Up is a badge for drinking beers over 65 IBU's (International Bittering Units) and is normally unlocked by IPA's, Barley Wine's and big Stouts. That was certainly the case here! The badge I used to whinge incessantly about, Riding Steady, thankfully did level up to Level 100 as soon as I had a qualifying check-in. For those of you still looking for it; beers under 5% ABV qualify for this badge. The badge for drinking Central & South American beers is Amazon & Andes. Not a heap of beers from that region make it to Australia, so I wasn't surprised at all that Cerveza Zulia (from Venezuela) only unlocked Level 2. By the Campfire is for drinking beers in venues that FourSquare, and by extension Untappd, consider to be outside. A Cricketer's Arms Spearhead on the way to a mates going away party did for Level 15. I was genuinely shocked by the level of Paint the Town Red after it was made retroactive! Two of Australia's premier craft brewers provided the beers that unlocked this badge for Red Ales and Red IPA's. Similarly I thought Bravo for Brown was quite low, although I feel like there are far less Brown than Red Ale's around. Feral's F-15, a bourbon barrel aged Imperial Brown Ale, was phenomenal and worth picking up if you come across it! Sky's the Limit is the badge for drinking beers over 10% ABV. The two commercial offerings were sensational - whilst the home brew offering has potential with a few more months on it. The badge for drinking Stouts and Porters is called Heavyweight. I finished this badge quite a while ago and I'm happy to see it return. You'll be seeing plenty of these when the weather starts to cool again. Swedish Brews is funnily enough the badge for drinking beers from Sweden. Thankfully we are seeing more and more Swedish breweries sending their beers to Australia now, as they are producing some seriously good beers! Take a Dunk is unlocked by drinking Dunkelweizens, a German style of dark wheat beer. It's a style that isn't very popular outside of Germany and there are very few Australian examples. One of the first international breweries to really grip me was Nøgne Ø, from Grimstadt in Norway. The badge for drinking Norwegian beers is Here Come the Vikings, and like most other badges, five different beers get you a level. So Udderly Sweet is unlocked by drinking Milk Stouts & Sweet Stouts. These styles are characterized by sweetness, usually imparted by Lactose. They're an underappreciated style, which is slowly getting more recognition in Australia. I think it's fair to say that 2017 was the year that sours really took off in Australia. Once the sole domain of the beer connoisseur, sours are slowly becoming accepted by the general populous. Pucker Up is the badge that commemorates check-ins to any style classified as a sour. One such sour style is Gueuze, a traditional Belgian Lambic style of beer created by blending freshly brewed Lambic with aged Lambic. Untappd recently released In With the Old, In With the New to celebrate this wonderful style! The intrinsically linked badge is Silence of the Lambics, a nice play on words. Lambics are a group of beer styles that are spontaneously fermented in the Senne Valley near Brussels, Belgium. They are wonderfully tart and often have fruit added to them during/post fermentation. Ich Bin Ein Berliner is the badge for drinking different Berliner Weiss'; a German style of sour wheat beers which are characterized by a lemony tartness produced by the lactobacillus used to sour the beer. In Germany it is not uncommon to find the style served with different syrups to sweeten them. Regular readers of this blog would be aware of my feelings towards Golden Ales (hint: it's not positive!). Fields of Gold is the badge that is awarded for drinking these typically sweet and boring beers. Checking into different Strong Ales is marked by the Iron Man badge. Strong Ale's fill the void between Pale Ales and Barley Wines in terms of ABV. They are maltier but less hoppy than IPA's that sit in the same ABV range. Imperial Czar is the badge for drinking Russian Imperial Stouts. Quite why only one level was unlocked in this period I'm not sure... The story of Russian Imperial Stouts dates back to the 1800's when English brewers began exporting strong stouts to Russia and the Baltic states. Probably the most confusing badge on Untappd is New Brew Thursday. It appears to be randomly unlocked on Thursday - however there is apparently a criteria! Simply check into a beer you haven't previously had on three Thursdays in one calendar month. The Backpacker is a relatively new badge which is unlocked by drinking beers from a number of South East Asian countries. A Cambodian Imperial Stout, of all things, unlocked the first level of this badge for me. To the Port is a badge commemorating the wonderful style that is Porter. The definition of Porter is highly contentious, when many believing that it's just a different name for stout. I'm sure most craft beer drinkers have their own take on this issue. Biere de Garde is one of the few indigenous French beer styles. This style is similar to Belgian Tripels with high levels of yeast ester and flavours ranging from sweet honey to earthiness. Beer for Keeping, the English translation, is the name of the badge for this unique style. Spanish craft beer is ever so slowly making its way into Melbourne with beers from Naparbier and DouGall's starting to pop up from time to time. Flamenco is the badge for drinking different Spanish beers. Given that I was housebound for much of this period with my foot, it's not hugely surprising that Beer Foodie was only unlocked once. Beer Foodie is unlocked by checking into beers at venues classified as restaurants. God Save the Queen. Not only the British national anthem, but also the Untappd badge for drinking beers from the United Kingdom. Interestingly - only Scottish beers unlocked this badge for me over the last few months. I'm always shocked at how low my level on The Wine of Beers badge is. I genuinely love Barley Wines, but clearly I drink too many of the same ones over and over again. They also aren't the most conducive style of beer for the Australian summer. A style that is perfectly suited to the Australian summer conditions is the Pilsner. Its associated badge; Crisp As Day, was unlocked by two lovely yet very different examples of the style. These are both worth checking out if you're a lager drinker! A style that is definitely not catching on in Australia is the Cream Ale - something I know has something of a cult following in the United States. Accordingly, I was genuinely surprised when this beer unlocked the first level of Cream of the Crop. Respect the Kölsch is the badge to commemorate the wonderful local beer of Cologne in western Germany. It's a light, refreshing ale that is becoming more and more popular among craft beer producers. A Wee Bit of Scotch is the badge for drinking different Scottish Ales & Scotch Ales. Both styles are malt driven with the Scotch Ale having a sweeter taste and higher ABV generally. One of my favourite beers unlocked this badge! The two beers to unlock Dubbel, Tripel and Quad Oh My over these last few months are both Victorian. The La Sirene is quite possibly the best beer I've had this year and may yet feature in my Golden Pints - if I ever get this post finished! To fully appreciate the name of the badge for drinking Gose's, the sour German wheat beer from Leipzig, you must understand that Gose is pronounced "Goes-UH!". What Gose Round was unlocked three times over the last few months. Birthday Brew, should be one of the more self-explanatory badges out there. Yes, simply check-in a beer on your birthday and this one is all yours. For those of you who know me - this also gives a good indication of how long this post has taken to write! 500 Million Beers is one of the more apt beer badge names I could think of given the situation. Named after Untappd's 500 Millionth check-in, rather than the number of beers I intended to (and subsequently did) consume on Grand Final Day. Barrel Aged Beer Day (2017) was awarded for checking in a barrel aged beer from The Bruery or Bruery Terreux on the first Friday in October. The one I had, Quadrupel Tonnellerie, was simply superb! One of my go to beers, Old Wives Ales' Hair of the Dog, unlocked the commemorative Untappd 7th Anniversary badge. Another of my favourites, Pirate Life Mosaic IPA, was the beer that did for Daily Checker. I try and have at least two alcohol free days a week, but this doesn't always happen... This badge is unlocked by checking in at least one beer a day for 7 consecutive days. I wondered how long it would be before we saw a badge relating to the "Serving Style" of the beer after Untappd brought the feature in. For the Can is one of 3 badges released for the "Serving Style" and is simply unlocked by drinking 5 beers from cans. Similarly, 99 Bottles, is the badge for drinking beers with the "Serving Style" as Bottle. I was slightly surprised that this badge, with retroactivity, was immediately unlocked - however it didn't take terribly long to rectify that. Witbier's are a style I go through phases of loving then loathing. Accordingly, levels of Keep Your Wits About You often come in waves. Both of these beers were quite palatable and I could see myself having them again. I went out of my way to ensure Czech it Out was as up to date as possible. I love Czech beers; particularly their lagers, both pale and dark. Kozel's range of lagers generally travel pretty well, are available at Dans and can sometimes be just what is ordered. This was a nice, crisp lager. Witch's Brew is the badge that commemorate Halloween every year. The (2017) version was unlocked by a beer from the style of the year; N.E. IPA. Lemon Juicy was a variant of 3 Ravens very successful Juicy. As usual on Stout Day I like to crack out something special that I've been holding onto for several months (sometimes even years!). Stout Day 2017 was no exception! Thankfully I decided do as the bottle said and shared it with dad - it was a monstrous stout! Not enough beers are deemed Fruit Beers. 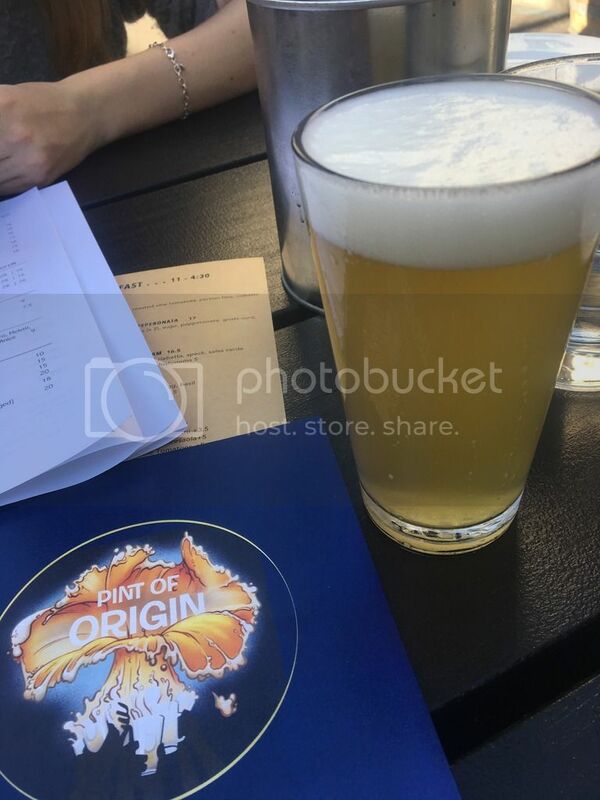 It's one of my pet hates that people don't classify beers correctly on Untappd. In any case, Fruits of Your Labor was unlocked by two very similar beers; our own raspberry wheat beer and one from Scottish brewers Fierce Beer. I've spoken many times about my love of Rye Beers, sadly there just aren't that many of them because rye is such a pain to brew with reportedly. In any case Rye it Up is unlocked by drinking beers classified as Rye Beers or Roggenbiers (which funnily enough is German for rye beers...). Session Life is a badge that I guess you will be seeing a lot more of in the future. This badge is for checking into beers classified as Session IPA's, another style that is under represented compared to how many brewers state that their beers are that style. The new Fixation Obsession is an absolutely brilliant beer, which I will be drinking plenty more of! Black Dog Aussie Terrier (Level 10). Schwarz-buckler is the badge for drinking different Schwarzbiers and Dark Lagers. I'm a huge dark lager fan, it's so unfortunate that none of the really good ones make their way down here - probably as the climate isn't as suited for it. I love Dutch beer now, something that makes me questioned why I spent to much time in Amsterdam (years ago!) in an American Craft Beer Bar... Going Dutch is the badge for drinking beers from the Netherlands. The two IPA's that unlocked this badge were probably the two best Dutch beers I've had. Probably because they were both really fresh! Thanksgiving is one of these American holidays that we don't really celebrate in Australia. The closest I get o thanksgiving is the badge they release every year, in this case Beer-giving (2017). It had to be unlocked over the thanksgiving weekend. Winter Wonderland is unlocked by drinking a beer which has the word "winter" in its name or style (ie. Winter Warmer). Some other words, such as celebration, also seem to trigger this badge. It's a confusing one, and one that seems to pop up randomly. As part of my trip to Adelaide for the Test Match, we dropped in on Coopers Stadium, the night before the cricket started, to take in some A-League soccer. Tailgater, a badge for checking into different sporting stadia, was unlocked by a full strength Coopers Pale Ale - something I'd like to see at more sporting venues! Bocks are a style of beer that I've never really warmed to. I'll Be Bock is the badge that celebrates all types of Bocks. This includes Eisbocks, like this 22% offering from BrewDog that was big, bitter and boozy! It's one of the most unique things I've tasted and is something I couldn't pass up if I see it again. I'm not 100% sure, but I don't believe I've unlocked Hella Delicious since it's been released. Retroactivity ensures that doesn't matter any more. Hawkers' new lager is classified at a Helles Lager, the type of lager that you need to drink to unlock this badge. Hoppy Hanukkah (2017) was released, like it is every year, to commemorate the 8 days of Hanukkah. Simply check-in to any beer during this time to unlock this badge - with any luck you'll still have a day or two after I finally finish this post! Wailing for Wales is the badge for drinking Welsh beers. Like almost all other badges, simply check-in 5 different beers from Wales and this badge is all yours. Tiny Rebel is really the only Welsh brewery that has beers regularly available in Australia - hopefully we see more in the not too distant future. After what seems like months, possibly because it has actually been months, this blog post is finally going up! The sheer number of Untappd badges these days, especially coupled with retroactivity made the task of writing the post in the normal manner almost impossible. I apologise for the formatting on this post - it just had to go up, so hopefully I'll fix it shortly. I've got a lot of stuff I want to get up in the next 5-6 weeks and I hope to be posting more regularly next year now that my studying is finalized. Thanks for your support guys, I'm hoping to get 2-4 posts up before the New Year so stay tuned!